We have made this recipe twice in as many weeks as strawberries were so cheap. 900g strawberries washed and hulled (if they were on the large side we cut them into a few pieces. I suppose this is the sloppy cooks way but I find it turns out pretty scrummy. Place the strawberries in a large bowl with about half the sugar and attack it with a potato masher. I didn’t have a potato masher so attacked it with a meat mallet (very indiscriminatory though). I didn’t smash the beejebers out of them, I just gave them a good talking to. I like to see some strawberries in their form and some really squished. Add the rest of the sugar and lemon juice, give it a stir and leave to sit overnight (if you are really desperate wait at least 3 hours). It should look very runny and foamy come morning with bits of strawberry. Stir them well and place in a large saucepan over low heat until the sugar is dissolved. Place a saucer in the freezer. Increase the heat and boil the mixture rapidly for around 20 minutes checking occasionally to see how the strawberries are… are they getting squishy and looking like yummy globs? Check to see whether your jam is ready by placing a small spoonful on the saucer that’s been in the freezer and put back in the freezer for 5 minutes. Meanwhile, take the jam off the heat and remove the ‘scum’ (usually foam that congregates around the edges) with a slotted spoon or tea strainer. Stirring in the knob of better helps to disperse any remaining scum. Take the saucer out of the freezer and use your finger to push at the edge. If the jam ‘wrinkles’ slightly at both edges, it is done. If it’s still runny return the jam to the boil. Remove from stove and stir in Jam Setta (the amount will vary depending on how set your jam is – I used 15g the first time with one large juicy lemon and around 7g the next with one and a half juicy ones. Both set well… that’s the tricky thing about jam! Best to try a small amount first, especially if the jam shows some indications of setting by itself). 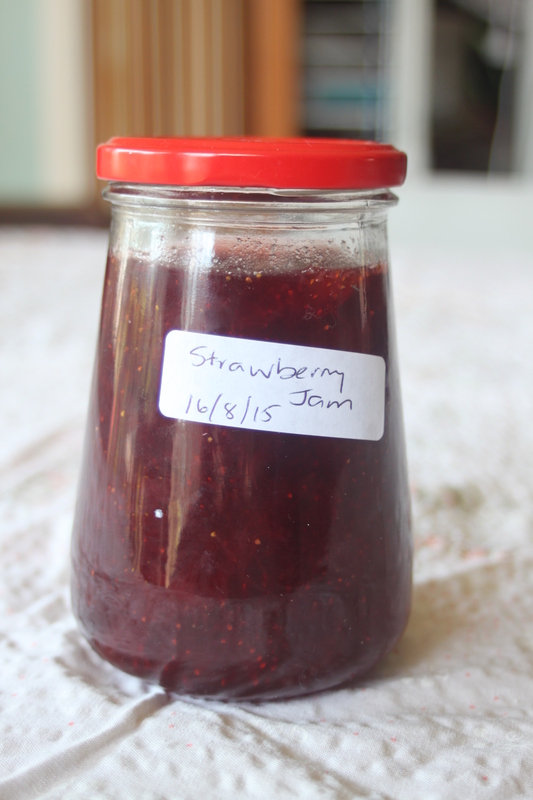 If the jam is being lazy (not setting) place the jam back on the stove and stir until the Jam Setta is dissolved. Do the freezer test again to test for setting. Leave to cool for around 15 minutes and bottle. I wash my jars in soapy water, rinse and dry with a micro fibre cloth then do a final dry in the microwave on low heat or in the oven on low heat. Fill the jars right to the top as the jam will shrink slightly when it cools. Enjoy! It’s pretty yummy and makes a good gift. My Ma was a heck of a cook in her day, experimenting with international dishes and filling us kids with the most wonderful food imaginable. Dad was a baker by trade with the bakehouse being in the family for over 100 years. Dad kept a full vege patch and friends in their circle shared a multitude of other fruits and vegetables. Between the two of them they raised money for the community through jams, pickles and cooking. It’s funny, I was mentioning the idea of recipes to Ma and she encouraged me to share them with you. She told me she thought that there were a lot of elderly people out there that didn’t eat properly… How very true, not only does your taste go as you get older, but if you are by yourself, preparing food can be a real chore. Especially when the food you want to buy comes in larger quantities than one person can use or is more expensive if you buy a smaller amount. I’m sure Ma will help me sort out the best ones.